« When did we burn Toronto? I don’t know which was more impressive, the two timber-frame barns being preserved and re-assembled or the massive airplane hangar of a workshop enclosing them. Of course, the two barns take precedence, since one of them may be the nation’s oldest barn, dating as far back as the 1690s. Still, I couldn’t stop looking at the features of the workshop: the two sides of window/doors which could slide open to remove structures as big as a barn or the rack of mechanical pulleys and cranes on guides running the length of the workshop. That structure was owned by a contractor who specializes in restoration, a middle-aged man wearing a polo shirt and khakis named David Lanoue. He recently opened up his workshop in Great Barrington Massachusetts to the public, who came to see the work in progress on the old barns and hear from those involved in the work. At that moment, the contracting crew of 15 interspersed in the crowd, but recognizable in their matching polo shirts, had assembled the roof of the newer barn. By newer I mean late 1700s. The end side of the older barn stood next to the roof. 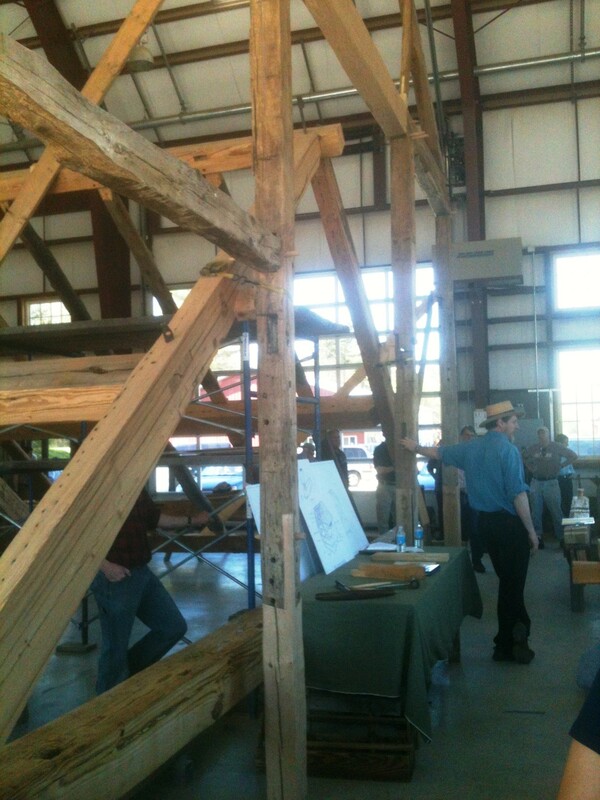 Laid out horizontally on workhorses were other large, tapered beams belonging to the older barn, so people could see the extent of the restoration process. An architect who specializes in timber frames spoke to the philosophy guiding the restoration. Looking like a farmer, wearing a Quaker-like hat, Jack Sobon emerged from the audience with little of the pretensions that he could claim from his having authored several books on timber frame construction and spent most of his life immersed in the subject. His manner was professorial, but he was teaching not only to the many carpenters and contractors in the workshop, but to those of us less familiar. Sobon, a consultant to Lanoue’s project, indicated that cost and time dictate the philosophy. Pointing to the various pieces of lumber stacked in rows around the room, he indicated that, under normal circumstances, restorers would have discarded much of the old wood. Instead, since Lanoue knew he was working on what could be the oldest barn in the country, he has adopted an approach to save as much of the old wood as possible, regardless of cost. So, rotted wood has been caringly replaced with white oak pieces, carefully cut to match the sections taken from the old beams. Can you see two barns? There was another philosophy that Sobon kept referring to, as he discussed the detective work undertaken on the original builders. Time and again, decisions made by New England builders in the 17th and 18th century were based on what was easy and what cost the least. Some old barns were built with no foundation, with corner beams dug right into the ground. Why? It was quicker and easier than digging and laying a stone foundation. He explained the assembling of the sides and the corner joints, creatively designed so the original measuring and laying out of the pieces could be done, lying flat on the ground. What became clear as both Lanoue and Sobon talked was their fluency in a different language. Terms like bends, bays, sills and joists fell easily from their lips but landed hard on the novice’s ears. Not only was the vocabulary new, but so was the ability to see words in all three of their dimensions, particularly evident when Sobon was talking about the corner joints, even with the model he brought to explain it. Here I learned I had wasted my life doing history and international relations. What will Lanoue do with these barns? He spoke of interest from private collectors, but I sure hope the Smithsonian is interested. They have the room in either the Building Museum or the American History Museum in Washington to house such a treasure. What a treat it was, in this quiet corner of western Massachusetts to see work of such importance to the whole nation. This entry was posted on May 15, 2013, 1:03 pm and is filed under Berkshires, History in our surroundings, Preservation, Public History. You can follow any responses to this entry through RSS 2.0. You can leave a response, or trackback from your own site.